While browsing I have found a recipe for some lovely, chocolaty, chunky homemade bourbon biscuits! The moment, I saw this bourbon biscuits I decided to bake them. Everyone knows about bourbon biscuit for its chocolate cream filling It surely is a hit amongst kids. 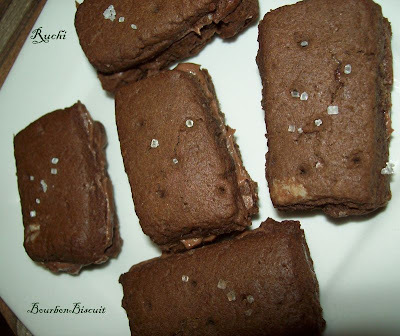 I took time out to try the recipe and make the bourbon biscuits. The biscuits came out very well. 1 Sieve together flour, baking soda, baking powder and cocoa. Keep aside. 2 In a bowl, cream together butter and white sugar until well blended. Add vanilla essence and golden syrup and combine. 3 Mix in the sieved ingredients with butter mixture and combine to form a soft dough. Add little milk to form the dough. 4 Place butter or plastic wrapping sheet on the work surface, sprinkle some flour and roll the dough into a large roti. Use a knife to cut into rectangle shape pieces. Use a toothpick to prick over the rolled out rectangle. Sprinkle white sugar on top of each rectangle. 5 Grease a baking tray and place each rectangle shaped dough on the tray and bake in a pre-heated oven at 180 degrees C for 14-15 mts or till the edges are toasted. Once baked, the cookie will feel soft on touch but once cool it will harden. Cool for 3 mts before proceeding with the filling. 6 Repeat the process with remaining dough. Mix all the filling ingredients to a smooth paste. Sandwich the biscuits with this chocolate butter icing. Bourbon biscuits makes me nostalgic, they turnes out prefect Akka..